Colin Hanks is a founding partner at Company Name with producer Sean Stuart, where he primarily directs and produces documentary films. He is also known for his success as an actor, and coming off his Emmy Award- and Golden Globe-nominated performance in the FX miniseries “Fargo,” Colin has most recently finished shooting Elvis and Nixon, a recreation of the meeting at the White House between Elvis Presley and President Nixon, starring alongside Kevin Spacey and Michael Shannon. Hanks was last seen in Parkland as Dr. Malcolm Perry, with Ron Livingston, Marcia Gay Harden, Paul Giamati and James Badge Dale, among other. The film is based on the book, Reclaiming History: The Assassination of President John F. Kennedy, and recounted the chaotic events that occurred at Dallas' Parkland Hospital on the day U.S. President John F. Kennedy was assassinated. Additional feature film credits include My Mothers Curse, the Oliver Stone biopic W, the ensemble comedy The House Bunny with Anna Faris, the thriller Untraceable with Diane Lane and director Gregory Hoblit, The Great Buck Howard with John Malkovich, Universal’s King Kong, directed by Peter Jackson, Paramount’s Orange County, Miramax’s comedy Get Over It with Kirsten Dunst, and the independent films Lucky, Alone With Her, Standing Still, Rx and 11:14. In 2002, Colin appeared, to critical acclaim, in the theatrical performance of This Is Our Youth, written by Ken Lonergan at the Garrick Theater in London’s West End. He was also seen on Broadway in Moises Kaufman’s Tony Award-nominated 33 Variations, alongside Jane Fonda in 2009. How did ALL THINGS MUST PASS come together? COLIN HANKS: It’s been a long journey, that’s for sure. It started off at a dinner I was having around the time the stores were closing. Someone said, in passing, “Hard to believe that all started in that tiny little drugstore in Sacramento.” It was like a light bulb went off. I knew the company had started in Sacramento. It had always been a source of civic pride. Some of my mother’s close friends had even worked at both the Sacramento and San Francisco locations, but I didn’t know about the beginnings of the company. That truly got my wheels spinning. I was dumbfounded that no one else had made a feature-length documentary on this amazing company. From that point on, I would mention the idea of the documentary to people and would watch people excitedly respond with their own personal connections to Tower. I ran the idea past my producing partner (and fellow Sacramento native) Sean Stuart, and we began the arduous task of trying to make the definitive documentary on Tower Records. What are the fundamental elements/themes of the film in your opinion? C.H. : The overall theme, really, is in the title: All Things Must Pass. All great rides have to come to an end sometime. It’s like what they yell out in the bar at closing time, you know? "You don’t have to go home, but you can’t stay here.” That was an initial theme from the beginning. As we dug deeper and got to know the people involved, I was really struck by the family aspect, that bond. These people came together and did something truly special. They spent, in some cases, 30 years of their lives working on making Tower what it was. The fact that something as iconic as Tower Records started off in my hometown of Sacramento really resonated with me. The fact that this company took these people around the world, what that journey must have been like for them; that’s a special thing. I really wanted to capture the fun and excitement of that. I also wanted to try and bring those stores back to life, in a sense. Why is this film such a passion project for you? C.H. : Aside from my own personal connections and memories of Tower Records, I have always loved music. Music has always been highly personal to me. Like most fanatics, I remember which stores I bought specific records from. I tried applying to two different Tower locations during college but I never heard back. As always, there was a long line of applicants in front of me. I suppose this is a way of living out my fantasy of working at Tower. After becoming an actor, I still wanted to do something that involved the music business, I just didn’t know what. I knew I was never really going to cut it as a musician. As I have gotten older, I have become obsessed with documentaries and hearing interesting stories from the people who actually lived them. So, naturally, combining the two and making a documentary about the music industry seemed like a natural progression for me. What is the dynamic of being a director – do you prefer one over the other? C.H. : There are aspects of being a director that I really enjoyed. Specifically, having a certain amount of control. But even that was limited. The process of coming up with the idea and convincing enough people that it was good one was not the easiest task, but I have found it to be incredibly rewarding. Directing a documentary is a challenge. It’s just as much detective work as it is directing. Trying to find the narrative and bringing that out of our interview subjects made me flex a journalism muscle I had NEVER used before. Lucky for me I had a talented group around me, at all stages, including our writer Steven Leckart and editor Darrin Roberts, whom were both instrumental in helping bring our narrative to life through these interviews and footage. How did you first become interested in Tower Records/the music industry and why focus on Russ Solomon in particular? C.H. : Once you meet Russ, it only takes about 0.03 seconds to know that he is a total character and just a great guy, but it started much earlier than that. I suppose growing up in Sacramento and going to Tower to buy my first cassettes and CDs was the starting point. I have a lot of memories of those stores as a kid. As I got older, going to other stores around the world and knowing that they were somehow connected, left some residual impression on me. Really it was that initial light bulb moment: hearing how the company started and witnessing how it was ending. That seemed like one hell of a ride that would probably make for an interesting film. C.H. : I’m still trying to find out! No one else had so I figured, “Why the hell not?" 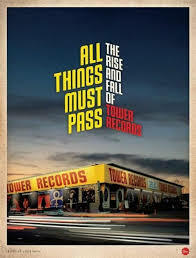 I think, ultimately, I just tried to make the kind of movie about Tower Records that I wanted to see. Something with the right balance of history and perspective, along with funny people telling great stories. I was really drawn to that. How has making this film changed you and how did the 7 year process change your opinion, if at all, from when you first began this project? C.H. : The project became much more personal than I initially thought it would be, in two ways. First, the film really became a story of a misfit family coming together and making Tower a success. The initial seed was much more basic: dates, locations, things of that nature. It wasn’t until we met Russ and the core group of people he introduced us to that the story really became something else entirely. For me personally, as time went on, I became more determined to finish the film and prove to myself that there was a captivating story in this, that most people didn't really know, and that it was an entertaining story. I’ve taken the task of telling this story very seriously in the hope that the people that worked at Tower would be happy that someone at least made an attempt. Since beginning this film, I’ve gotten married, had two children, and moved across the country: so clearly, I’ve changed in that I don’t spend nearly as much time in record stores as I used to. That said, I still spend quite a bit of time at local record shops. I’ve fully made the jump to vinyl. When I travel I bring a portable turntable with me and do not bring any albums with me. I find it forces me to go out and explore each city in a fun and exciting way. Whatever I buy, I label the city where I bought it. It adds a fun dimension to my music collection. You know, just your average “High Fidelity” level type obsessive behavior, which has only increased in the years since I’ve begun making this film. What was the most surprising message from those featured in the film? C.H. : How adamant Russ was that the success of Tower had very little to do with him. In one respect, he is being incredibly modest. Yet, he is also spot-on. The real reason why Tower was a success was because of all the people that worked in the stores. They made each store their own. Each location was truly unique; that attention to detail, by the people in the stores, and the awareness of the “higher ups” can’t be overstated. What joy and sorrow did you find while shooting? C.H. : Using Kickstarter to keep our film alive was a great joy. It gave us the sense that we were indeed on the right path, and that we were not crazy in thinking that this could be a documentary. There was a specific moment for us, in which the ending we had always hoped we would be able to capture actually happened. It was a relief knowing that we had actually been able to capture the ending, which had always seemed like an impossible dream. As for sorrows: I don’t have time for that. What were some of the challenges you faced while making this film over the years? C.H. : There were so many challenges in making this film, I feel like I have blocked most of them from my memory. Initially, trying to get funding in the middle of one of the worst economic downturns our country has ever faced was a huge challenge. Most people didn’t understand, or simply were not interested in, making a film about a music retailer going bankrupt, when banks, car manufacturers, and Lehman Brothers were going out of business at that very moment. It’s been a challenge making a music documentary that isn’t focused on one band, or one star, but rather the guys and girls in the stores helping connect those people to the listeners. Those people, the clerks and employees, are not always the most celebrated people in rock and roll, but most of time, they are the ones you can relate to the most. How would you describe the film to a person you just met on the street? C.H. : Aside from the fact that it’s the coolest documentary you need to know about? It’s a documentary about a guy and his band of misfits who worked in the music business, who bonded together, took over the world, had the time of their lives thinking the party would never end, only to have someone flip on the lights and kick 'em out. C.H. : I hope they have a good time. I hope they feel like they have gotten to know Russ and some of these people a bit better and gone on the journey with them. I hope they have a better understanding of the events leading up to the demise of the company. There is so much history, so many elements and opinions on what happened, but most people don’t really know why it’s gone. My hope is that those who were there will remember how great it was and what a unique moment in time it was when Tower first started opening their doors in Sacramento, San Francisco, and Los Angeles. For those who weren’t around, I hope that they will wish they were! At the end of the day, I hope it makes everyone want to go directly to their local record store and spend some time going through the bins. You never know who you might meet, or what cool new band or music you might discover.